Crane Hoppers are designed and load rated for overhead lifting. Crane skips, also known as trash skips, are designed for construction sites where a crane is the only way to dispose of waste & debris from a building. 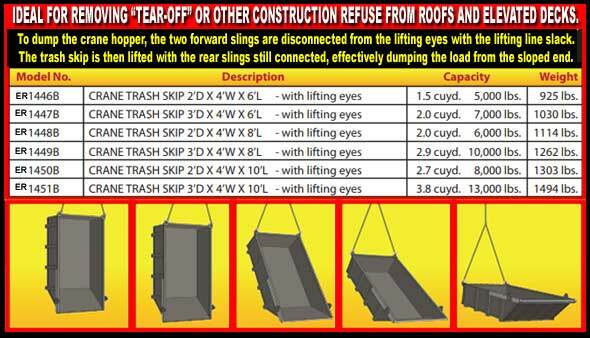 Crane hoppers can easily self dump rubbish or roof tear off into a waiting trash container. Equipment manufactured with strict attention to safety and design standards define our products. ER1447B CRANE TRASH SKIP 3’D X 4’W X 6’L – with lifting eyes 2.0 cuyd. 7,000 lbs. 1030 lbs. ER1448B CRANE SKIP Pan 2’D X 4’W X 8’L – with lifting eyes 2.0 cuyd. 7,000 lbs. 1114 lbs. ER1449B CRANE TRASH HOPPER 3’D X 4’W X 8’L – with lifting eyes 2.9 cuyd. 10,000 lbs. 1262 lbs. ER1450B CRANE SKIP PAN 2’D X 4’W X 10’L – with lifting eyes 2.7 cuyd. 9,000 lbs. 1303 lbs. 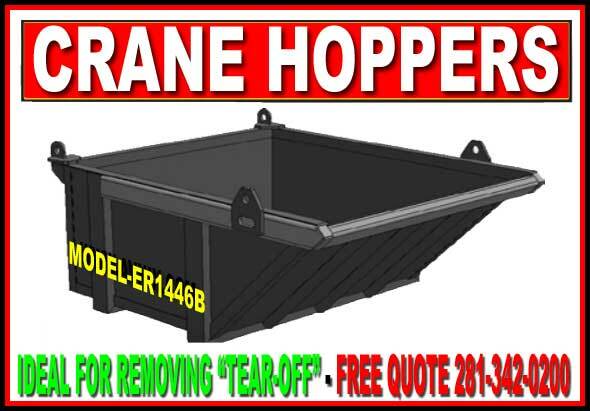 ER1451B CRANE TRASH BUCKET 3’D X 4’W X 10’L – with lifting eyes 3.8 cuyd. 13,000 lbs. 1494 lbs.